So why would the MET Office miss out one of the principle causes of the Foehn Effect in its info-video they tweeted out? Is it that the MET Office is staffed by people who don’t understand the basic thermodynamics of meteorology these days? Or could it be they don’t like Ned Nikolov and Karl Zeller’s discovery that adiabatic heating in the pressure gradient is the cause of the ‘greenhouse effect’ rather than trace gases like water vapour and carbon dioxide. It also contradicts what the MET-O say on their own website! I made an info-graphic by modifying the NASA energy budget to show how adiabatic compression heating is an important factor missed off by climate scientists in their models. They don’t account for the way descended air heated by adiabatic compression will impede the surface-air conduction rate by lowering the temperature differential. It looks like the propaganda war to deny this critical omission has started. I wonder if the MET Office webpage containing the vital information about the Foehn effect will get edited. Perhaps not now I’ve web-cited it and documented this attempt to erase the gravito-thermal effect of convection. I am confused by this. If IR radiation is not important, then why are the Poles very cold in winter? Just the lack of direct warming? There seems to be really no legitimate excuse for the Met Office to misrepresent so egregiously the fundamental pressure-heating mechanism of Foehn winds (called Chinooks in North America: https://en.wikipedia.org/wiki/Chinook_wind). As Roger suggested in the above post, I think the Met Office probably got wind of our discovery about the thermodynamic (non-radiative) nature of the so-called “atmospheric Greenhouse effect”, and is now actively trying to avoid any mentioning of adiabatic heating caused by increasing pressure… Their explanation for the warmth of foehn winds is simply ridiculous! In their video, they state that the absence of clouds on the leeward side of the mountain allows more solar energy to reach the ground and the turbulence of the descending air somehow causes further heating!!?? It’s on the Talkshop now. PS the Wikipedia entry on Foehn has much the same wording as the MetO site. But they call it ‘Isentropic draw-down (the draw-down of warmer, drier air from aloft)’. As I understand it, in a stable atmosphere there is an increase in potential temperature with height of 3ºc/km due to presence of water vapour.The air being 3ºc/km warmer than it should be for its height though still colder with altitude by 6.8ºc/km. How much of this is down to latent heat released by condensation or the ability of water vapour to radiate energy to warm the air above and so cool the air below is up for discussion. starts mixing potentially warmer air from above with the colder below. If dry air blows over a mountain range without any turbulent mixing of air with a higher potential temperature from above it would increase temperature at the same rate on the descent as the ascent. …it would increase temperature at the same rate on the descent as… it cooled on… the ascent.! Lenticular clouds that you see static on top of mountains are a good example of what is happening here. In fact although the cloud appears static the wind is still passing through it. Adiabatic de- compression on the windward side decreases the temperature and causes condensation. Hence the cloud. On the lee side the opposite occurs and the cloud disappears. Meanwhile the wind passes on. The prime interest here is that it is gravity which ultimately determines the temperature albeit in conjunction with the properties of water where phase change takes place at constant temperature and generates buoyancy which transports the Latent Heat upwards in opposition to the adiabatic compression factor. CO2 and Radiation are irrelevant here; for it is purely a matter of where the enthalpy lies. Temperature or Latent Heat. Take your pick. That’s the entire entry for the above website, under that title. The west wind in the Vienna region is canalised along the Danube in Upper Austria and overflows the Vienna Woods. The strength can be estimated by considering the difference of the air pressure between the Inn-area in Oberösterreich and the Burgenland. Statistical evaluation shows that the difference of the air pressure has to be at least 4 hectopascal, to have strong winds in a large area. Foehn winds are commonly observed in the lee of large mountain ranges and are typically associated with large temperature increases and relative humidity decreases due to adiabatic compression of the descending wind. Nikolov and Zeller point out the phenomenon but do not explain it. Stephen: N & Z don’t explain it in their paper because it’s not their job to be explaining well known meteorological effects to atmospheric scientists! I haven’t seen a source anywhere else that describes how the mechanism of adiabatic convection translates into a higher than S-B temperature prediction for the entire surface area of a rotating planet. It doesn’t seem to be well known to anyone otherwise the radiative theory would never had been so broadly accepted and if it had been I wouldn’t have needed to create such a description. Hail, sleet and snow showers will leave surfaces prone to patchy ice, together with slushy snow over some upland routes. Stratospheric intrusions in the winter bring very cold air from the north. The level of the tropopause is lowered. 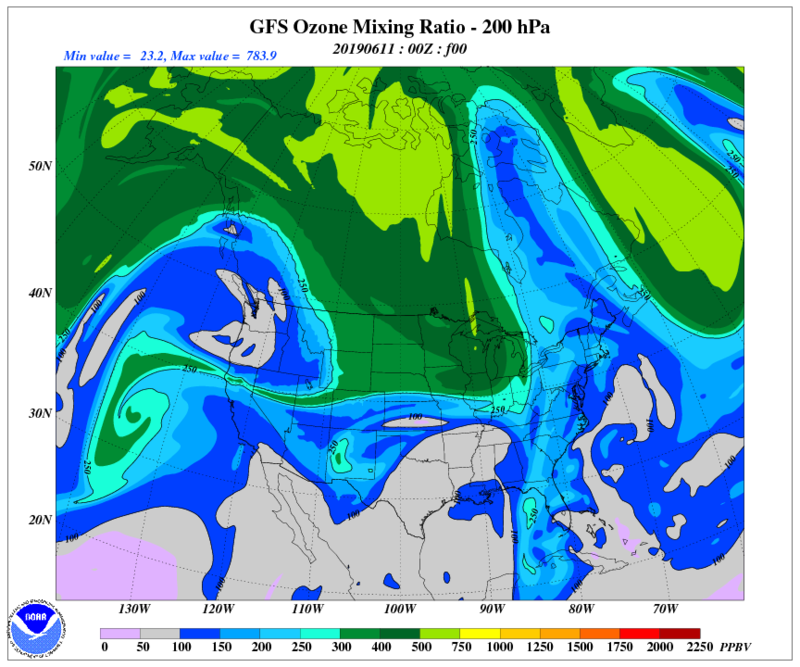 Along with the dry air, Stratospheric Intrusions bring high amounts of ozone into the tropospheric column and possibly near the surface. Our research has shown that the entire Atmospheric Thermal Effect (a.k.a. “Greenhouse Effect”) on any planet and moon (including Earth) is a form of compression heating. Hence, it is independent of atmospheric composition! I have been saying that for years and have created a clear description of the mechanism involving conduction and convective overturning. The point is that convective overturning of gases cannot be prevented above an unevenly heated surface beneath an atmosphere. The concept of an isothermal atmosphere as proposed by Roy Spencer and others is physically impossible because such overturning involves conversion of KE (heat) to PE (not heat) in rising columns and the reverse in falling columns. Such overturning obviously represents a slower rate of energy transfer than radiative transmission so the process of overturning introduces a slowdown in the rate of radiative energy transfer through the system and surface temperature must rise above the purely radiative S-B prediction. An ‘additional’ energy store is needed at the surface to sustain continuing convective overturning in addition to sustain radiation escaping to space at the same rate as radiation comes in from space. The reason that density serves as a good proxy for the amount of temperature rise is because greater density increases the efficiency of conduction between surface and atmospheric gases. The presence of the lapse rate slope provides a marker in the vertical plane which shows the changing effect with density of conductive efficiency relative to radiative efficiency. As one descends along the lapse rate slope the thermal effect of conduction gradually increases relative to that of radiation with a consequent rise in temperature. An atmosphere reaches long term hydrostatic equilibrium when radiation and conduction are perfectly balanced on average and any imbalances are then neutralised by convective adjustments. That is the real cause of the greenhouse effect and it is nothing to do with radiative gases.